First look at mystery fish caught in Denton, Texas. Maybe it’s that time of year? The tropicals are getting a bit feisty and biting at baited hooks again. I came across a guy who fishes my neighborhood with the greatest of regularity, and he told me about a “piranha” he had caught in that pond at nearly the same time this one was caught. Skeptical as I can be, I asked him if he still had the fish, and low-and-behold, he did! He had the monster frozen away in his freezer, and offered to give it to me to get an ID from the Texas Parks & Wildlife Department (TPWD). He called me, and we finally made connections for the handoff of the mystery fish earlier this week. There was always the chance it was the more common pacu. However, the face of the fish was frozen over with a frost that, unless I thawed the darn thing, would maintain the mystery until thawed by the TPWD. All I could see was that it’s no ordinary fish. It’s either a red belly pacu, or a red belly piranha. I had a few choices before bothering the local TPWD with an innocuous pacu. I could leave the fish frozen, and go look at a live pacu at the local “Fish & Chirps,” or I could thaw the face and check the dentures for positive ID. The problem with all that is, if it is a piranha, the fact it has been probed may become a problem for the science minded folks. 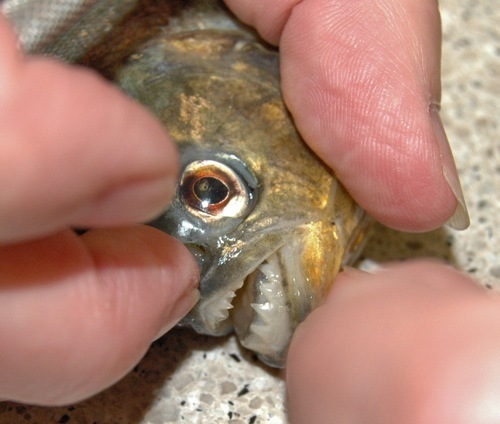 Just looking at photographs of the dentures of a pacu versus a piranha, although related and toothy, seems to be all one would need to do to make the ID. A more detailed look at the mystery fish. After realizing there is no “operator standing by” to collect unusual specimens for the TPWD, I decided that it was time to go local. Joel Hays, chairman of a local high school science department, seemed like a logical choice, and with no further ado, I enlisted his services with a text message last night. 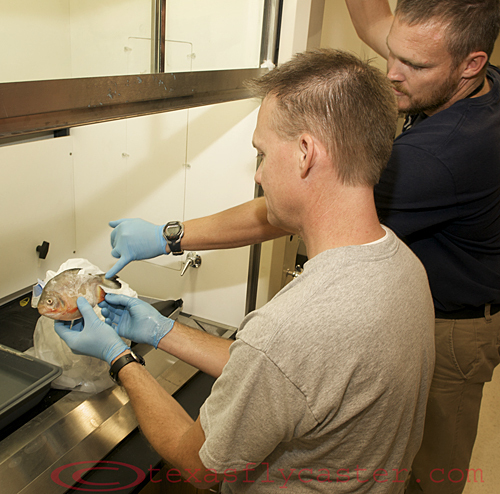 This afternoon, just before the insanity of class letting out at his school, Joel escorted me to one of his labs, and back to a vent hood to take a closer look with the help of teacher Matthew Trowbridge, who also has a keen interest in fish and fishing. 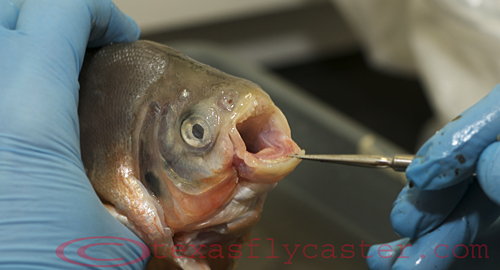 Once we unwrapped the fish, the thawed dentures gave it away as pacu. Being the good scientists they are, of course they didn’t stop there. A little more thawing and we were able to open the mouth and get a good image of the grinding (as opposed to tearing) teeth. Then, they just had to know what a pacu in a pond in Denton, Texas, would be eating. Amazingly, probably due to the vent hood, I was completely fascinated and not effected by smell or sight. 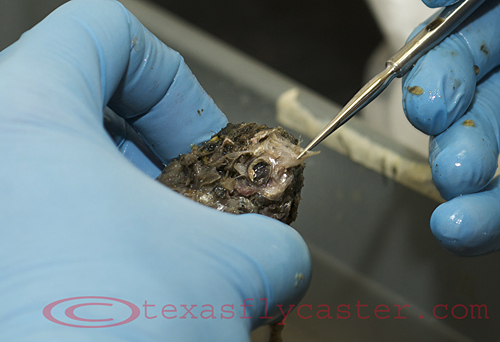 Inside the stomach and intestines, was plant matter, seeds and even a sizable shad. The ribs of the pacu are large and sturdy for such a small fish as well. It was truly amazing just how much this fish had eaten, the vast majority of it being seeds. Confirmed beyond a shadow of doubt; Piaractus Brachypomus, or red bellied pacu. 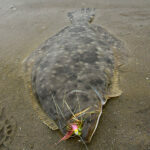 It would have to be an aquarium release, as that is the only known way they appear in Texas waters. 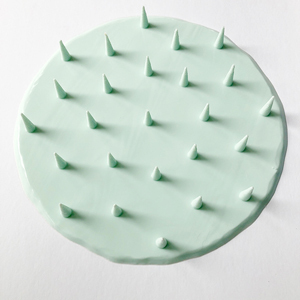 They have reportedly wintered over in warmer Texas waters. I didn’t instantly find a specific law prohibiting introduction of pacu, but I would imagine it to be illegal as it is a non-native species. The end of the following TPWD report spells out what the penalties are for releasing something like the obviously harmful piranha. 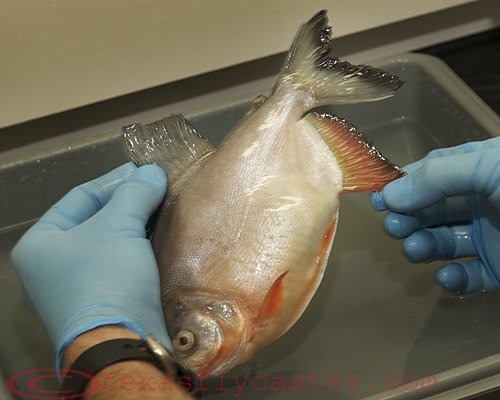 AUSTIN – A rare catch of a red-breasted piranha in a community lake near Houston recently illustrates the need for prohibition of invasive aquatic species in Texas waters. Piranha teeth look quite a bit different from pacu. 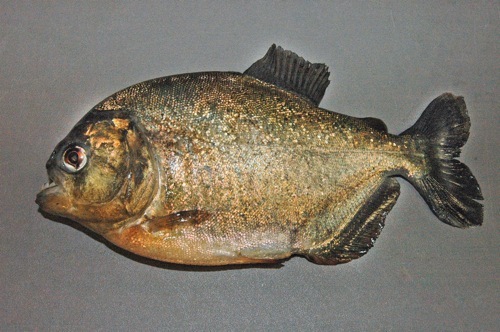 According to Texas Parks and Wildlife Department officials an actual piranha is a VERY rare occurrence in the wild—only 2 documented specimens in 30 years—and possessing and releasing live piranhas and dozens of other exotic, harmful or potentially harmful fish species is prohibited by Texas law. 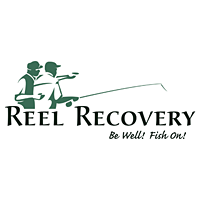 Dave Terre, management and research chief with TPWD’s Inland Fisheries Division, said the 23-acre Tom Bass Park community lake in Pearland on the outskirts of Houston where the piranha was caught on Aug. 27 remains a great place to go fishing and is completely safe to go fishing there. Biologists say piranhas are unlikely to be able to over winter and they will not reproduce.